A couple years ago, we had a crazy windstorm followed by a heat wave in my little town. My power was knocked out for two weeks. My friends and I held nightly BBQs to eat all our frozen food before it went bad. To add to the wonderfulness of this moment in time, the heat also caused the radiator in my car to break. I am far from what I would consider handy with cars. In my college days I would open the hood of my car and hit things with a hammer that I thought weren't working correctly. But my dad was amazing with them. He even restored old cars, so I figured there might be a Super-Mechanic in my blood. And thanks to the internet, there are thousands of videos out there to show me how to do it. After watching about 15 of them, I bought the part and that night I set out with a battery powered flashlight (because the heat in the day was intolerable) to prove to myself I was my father's son. Several hours, curse words and cuts on my hands later; I triumphantly pulled the broken radiator out of the front of my engine. As I stated, my previous work with cars had all been hammer related, so this was quite the accomplishment. As I looked at my achievement, I realized, "Hey, this is just a big fan." And I remembered a thought I had previously let go of. A few years before, I was bored somewhere and had started thinking, "If we put some sort of fan or wind turbine on a car, wouldn't the car eventually reach a speed where the wind turning the fan/turbine could be used as energy?" I have a brother and a brother in law who are much closer to my father's genius with cars, and I brought this idea up to them and they both kind of chuckled and said, "Would never work." So I let it go. But the idea still stuck up in my brain. And a few weeks ago I Googled "wind powered cars" just to see if anybody else had the same silly idea. Turns out, there were quite a few. The first was a Fox News story from 2012 (cited below-1) of a farmer in China who had built a battery powered car with what looks like (but isn't) a household fan attached to the front. The car runs on batteries until it reaches 40 mph, then the fan kicks in. The speed of the vehicle begins turning the fan, or turbine, and the fan/turbine recharges the batteries. Most of the energy in the world is created though turning turbines. And I thought, "There you go!" The article contains a link to a video of the car in action. After enthusiastically watching the video, I made the mistake of reading all of the comments people had made on the video. Most of them sounded just like my brother and brother in law. "What about the drag?" "Would never work." "The car would work better without the fan." "You are forgetting Bernoulli's equation." Someone always has to crush my dreams. Damn you Bernoulli! If you look this up, you will find Bernoulli states that, "an increase in the speed of the fluid (air in gas form is the fluid here) occurs simultaneously with a decrease in pressure or a decrease in the fluid's potential energy." From all the comments on the video, I take it this means that, as the vehicle accelerates, the fan will cause more drag and require more energy than it would create. Drag increases with speed. But, let's take a look at the next link I found. A man named Rick Cavallaro has created an entirely wind powered vehicle called The Blackbird (cited below-2) that goes faster than the wind. The writer of the article states, "The counterintuitive idea that you can travel downwind faster than the wind is casus belli (Latin for an act or event that justifies war) for aerodynamic arguments from internet forums to college classrooms. The concept known as DWFTTW can cause world-renowned physicists to throw their Nobel Prizes in fits of rage." Cavallaro says "Skeptics think that the wind is turning the prop (propeller, fan or turbine), and the car is turning the wheels, and that's what makes the car go. That's not the case. The wheels are turning the prop. What happens is the prop thrust pushes the vehicle." The article states, "So, the wheels turn the prop, which turns the vehicle's wheels, which turn the prop, which turns the vehicle's wheels." Got it? I don't. If the wheels turn the fan, how does the vehicle start moving? Here is a better explanation from Tammie Painter of Demand Media, who describes wind powered cars like this, "For the propeller car, the car itself waits to be pushed by a tailwind. This turns the wheels, which then turn the propeller. The thrust of the propeller makes the wheels turn faster, and this makes the propeller turn faster. The wind resistance of the car begins the car's motion, but the wind resistance caused by the propeller blades creates the thrust that keeps the car moving." The first test Cavallaro did was downwind, and he achieved a speed that was 2.86 times faster than the wind, with a wind speed of 13.5 mph. He has since repeated the test upwind and achieved a speed 2.01 times faster than the wind (cited below-3). Doesn't that prove that a prop/fan in a moving vehicle can move faster than the wind and create energy? Granted, if you take a look at his design, it is far from feasible for current highway travel. But the future is coming faster than we think. It's 2014 for goodness sake! Mercedes Benz submitted a concept for a car in 2008 to the "Design Los Angeles Automobile Design Challenge" called the Formula Zero Racer (cited below-4). This was a competition to imagine what the race car of 2025 might look like. The challenge though was not only about speed, but also energy efficiency, all racers would be given the same amount of energy to compete with. According to the article I read, "The Formula Zero Racer is a "zero-emissions racer" that "is propelled by a wind-catching sail in addition to electric motors that are powered by renewable resources." It's an electric car that is powered by batteries that are recharged by solar panels on the car, and a wind turbine in the nose. Oh, and a big sail. Maybe it is possible. Mercedes seems to think so. According to HIS Automotive and Polk, worldwide production of electric vehicles is forecast to increase 67 percent to 403,000 units this year. Electric cars use the energy created when you apply the brake to recharge the battery, through a process called Regenerative Braking. This allows the kinetic energy of the moving vehicle to be captured and used as an energy source to recharge the batteries. If the wheels of the car were hooked up to a fan/turbine as well, as in The Blackbird, couldn't we recharge the batteries in a similar way by stopping our fan/turbine and increase the charge sent to the batteries? Or perhaps once a certain speed is achieved we can generate wind power, as with our Chinese farmer? My thought is, there is already a fan in our cars, sometimes right in front of the motor, sometimes right behind it, called your radiator. It is there to cool your engine, and is run by your battery. There are two types of radiator fans your car could have, either push or pull. One is in front of the engine and pushes air over the engine. The other is behind the engine, and pulls air over the engine. Now let me just state that my college degree is in acting, not physics, but wouldn't these fans begin to turn on their own once they reached a certain speed? Perhaps not enough air will make it to the fan through the hood and grille of the car, but that doesn't sound like a difficult fix. Couldn't energy be created by this spinning turbine? Or by the fan/turbines assistance in turning the wheels and the wheels turning the fan, as in the Blackbird? Or even the resistance of keeping that fan at a certain speed once the car has accelerated beyond that speed? And again, when the brakes are applied and the car is stopped? Wouldn't the fan/turbine cause resistance as it is slowed down, if the fan was connected to the wheels as in The Blackbird? I apologize that I have no idea how to calculate the math to this, but I know one of you out there can. Some of the comments on the Chinese farmer's video said that having the fan/turbine in the front would cause too much drag, but some did suggest that perhaps having the prop on the side or even behind the vehicle could help offset the drag. 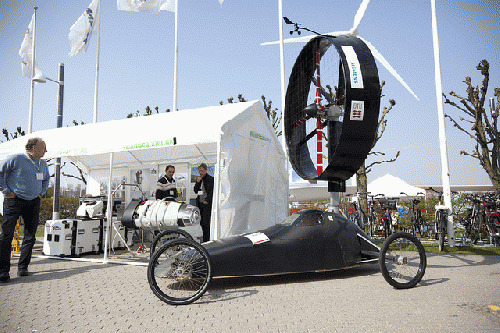 The Blackbird's wind turbine is behind the vehicle. Unlike the Blackbird though, I am not asking for an entirely wind powered vehicle; I am just proposing that every little bit helps. If even a little energy can be derived in this manner, isn't it worth a shot? If regenerative braking can recharge a battery, wouldn't the fan/turbine connected to the wheels only increase this energy? For more fun, as solar technology becomes cheaper and more efficient, what if we cover the top of all buses and semi trailers with solar panels that help charge an electric or hybrid engine? Or, a company called Doty Windfuels has come up with a way to convert CO2 Emissions from Coal and Natural Gas based power plants (yes, that's the stuff they say causes Global Warming) into fuel that can be used as gasoline for cars, planes and more. Their site claims, "We will use recycled CO2, water, wind energy, and some shale gas (as long as it is cheap) to make liquid fuels such as gasoline, diesel, and jet fuel. No Magic. Just good physics, chemistry and engineering." Ok, not crazy about the Shale Gas part, but we have to start somewhere. When we try to take steps forward, sometimes we set too high expectations. I once read a self help book that said we should set small goals for ourselves that are achievable as we strive toward our larger goals. If we just see the final goal as our only objective, it can often seem too far away, and too difficult to accomplish. We can't just stop using oil tomorrow, but one day we are going to run out of it. I believe there will not be one answer to our energy woes; it will be a combination of many things, new and old. But if we set a goal of increasing gas mileage or driving range through some of these new ideas or technologies, we will take one more step to my and Mercedes Benz "s dream of a zero emission vehicle that runs entirely off the wind and the sun. C'mon 2025! Tim is a some-time activist living in Ohio who thinks things should be a little bit more fair. 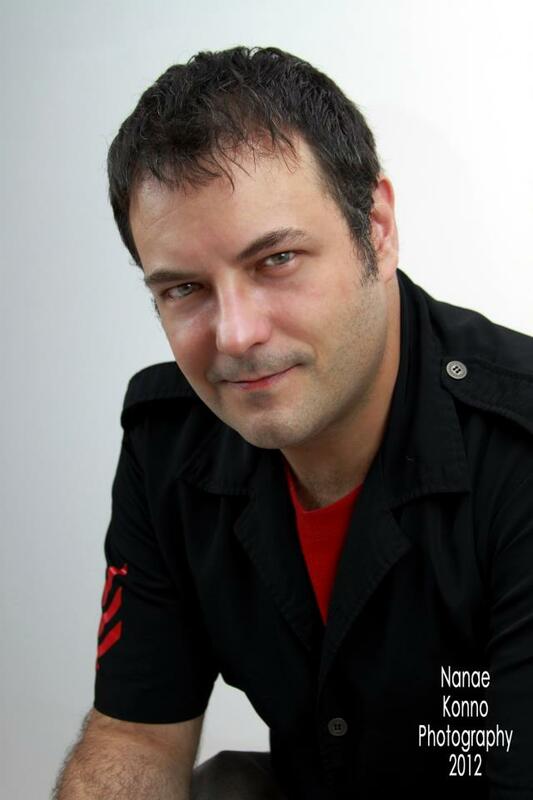 He has also worked as a musician and an actor, performing throughout the US, Europe, and Japan. A Failed Project for the New American Century? What Happens To All That Uranium?